Background:Non-pharmacological interventions for Behavioral and Psychological Symptoms of Dementia (BPSD) have been developed; however, a systematic review on the effectiveness of this type of intervention from a perspective of ergonomics is lacking. According to ergonomics, the capabilities of Persons with Dementia (PwD) should be considered in the interventions for the outcomes to be reliable. 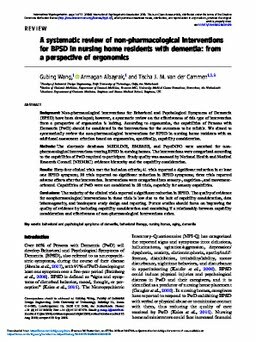 We aimed to systematically review the non-pharmacological interventions for BPSD in nursing home residents with an additional assessment criterion based on ergonomics, specifically, capability consideration.Methods:The electronic databases MEDLINE, EMBASE, and PsycINFO were searched for non-pharmacological interventions treating BPSD in nursing homes. The interventions were categorized according to the capabilities of PwD required to participate. Study quality was assessed by National Health and Medical Research Council (NHMRC) evidence hierarchy and the capability consideration.Results:Sixty-four clinical trials met the inclusion criteria; 41 trials reported a significant reduction in at least one BPSD symptom; 20 trials reported no significant reduction in BPSD symptoms; three trials reported adverse effects after the intervention. Interventions were categorized into sensory-, cognition-, and movement-oriented. Capabilities of PwD were not considered in 28 trials, especially for sensory capabilities.Conclusions:The majority of the clinical trials reported a significant reduction in BPSD. The quality of evidence for nonpharmacological interventions in these trials is low due to the lack of capability consideration, data inhomogeneity, and inadequate study design and reporting. Future studies should focus on improving the quality of evidence by including capability consideration and examining if a relationship between capability consideration and effectiveness of non-pharmacological interventions exists.